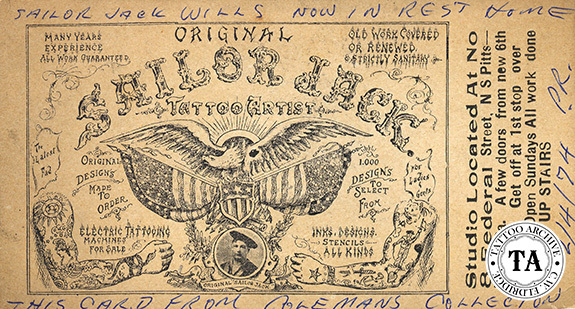 Jack Wills, better known in the tattoo world as "Sailor Jack", was born May 31, 1887. Wills served in the United States Navy around the turn of the century. How long he actually served is not known. For many years afterwards, one would see large photographs of Wills as the Navy's welterweight wrestling champion hanging on the walls of his tattoo shops. 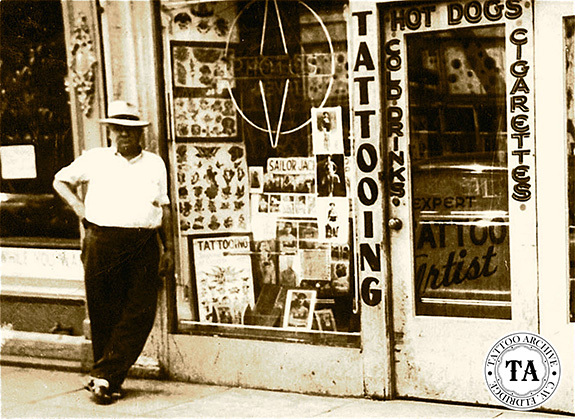 By the late 1920s Sailor Jack was tattooing in Pittsburgh, Pennsylvania in an upstairs location at #8 Federal Street. It is unclear who he learned to tattoo from; maybe he picked it up while in the Navy. The #8 Federal Street card seen here is from the Cap Coleman collection by way of Paul Rogers. The notes written on card are by Paul. Although his business card advertised machines, inks, designs, and stencils for sale, Jack Wills was not thought of as a supplier. Many tattooists from this era offered machines and other supplies on their business cards, as it was an easy way for them to sell off any supplies that did not meet their standards. The 1940s found Sailor Jack on the world famous strip known as East Main Street in Norfolk, Virginia. There he worked with Bill Grimshaw at #421 East Main and E.J. Miller at #433 East Main, all just a few doors away from Cap Coleman's Place. The 1947 photograph seen here is Jack Wills in front of his shop in Norfolk, Virginia, address unknown. In the 1950s Wills moved to Hopkinsville, Kentucky where he would stay until his retirement. His first shop in Hopkinsville was located in a rifle range arcade at #414 East 9th Street. Throughout the years Sailor Jack moved up and down East 9th, setting up shops at #402 and #416 East 9th. It was during these years that Col. W.L. Todd visited Wills. Todd was tattooing just across the state line in Clarksville, Tennessee at this time. In later years Todd made a name for himself working with Bert Grimm and Bob Shaw at the Nu-Pike in Long Beach, California. Todd said that Jack Wills was the first to show him the advantages of DC power, and helped him greatly in his tattooing. Sailor Jack retired from tattooing in 1968 and spent most of his later years in a nursing home in Alabama. 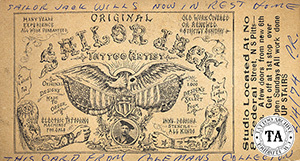 He wrote regularly to Paul Rogers and in his last letter dated December 15, 1975, Sailor Jack wrote, "I dream sometimes about tattooing." Jack Wills died in June 26, 1976.